AMC Entertainment (AMC) has expanded their Sensory Friendly Films program in partnership with the Autism Society! This Tuesday evening, families affected by autism or other special needs have the opportunity to view a sensory friendly screening of War Dogs, a film that may appeal to older audiences on the autism spectrum. 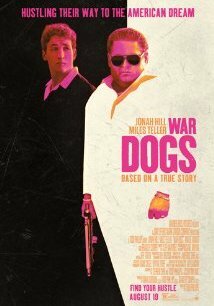 AMC and the Autism Society will be showing War Dogs tomorrow, Tuesday, August 23rd at 7pm (local time). Tickets are $4 to $6 depending on the location. To find a theatre near you, here is a list of AMC theatres nationwide participating in this fabulous program (note: to access full list, please scroll to the bottom of the page). Editor’s note: Although War Dogs has been chosen by the Autism Society for a Tuesday Sensory Friendly screening, we do want parents to know that it is rated R by the Motion Picture Association of America for language throughout, drug use and some sexual references. As always, please check the IMDB Parents Guide for a more detailed description of this film to determine if it is right for you and your family.